Most fantasy football players do not like to waste a high pick on quarterback, kicker or defense. These are positions that can be grabbed from waivers weekly based on matchups. This is your cheatsheet to decide which high-upside plays are best for your squad on a weekly basis. Feel free to plug and play whichever player or defense fits your need this week. I know, I just made you throw up in your mouth. For that I apologize, but I am unapologetic about the Jags upside against the Indy D. The status of Leonard Fournette is a bit up in the air at the moment. That could affect this pick, as the Jags set up the pass with the run. I still like Bortles to put up at least 20 points against one of the worst pass defenses in the league. If there is a time to start the chucker of lame ducks, it is week 7. This one stings a bit as I drafted Taylor in several leagues. Those drafts took place before the Sammy Watkins trade, but I still thought Tyrod was starter material. As it turns out, he is more of a matchup based fill-in. Taylor has lost his safety valve in Charles Clay and his budding rapport with Jordan Mathews was cut down by injury as well. Still, the Bucs are not good against the pass and the Bills will be forced to throw in this one. The Buffalo defense is going to get run ragged chasing the Bucs skill position players. Roll with Tyrod if you need help in week 7. Butker has been great and he will put up some points in week 7. 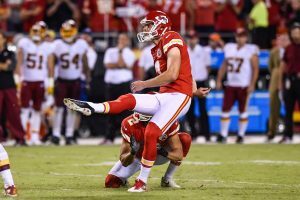 The Chiefs offense knows how to put points on the board and their young kicker is no exception. In week 7 the Chiefs face a Raiders team that has given up double digit points to kickers every week but one. In that other week, they gave up 9 points. It is a safe bet that Butker is going to get you at least 10 if you roll him out there. The Jaguars and Myers have produced a couple of decent kicker performances. In three out of the first four weeks, Myers scored 8 or more fantasy points before tailing off a bit. A matchup with the Colts should be all that it takes to get back on track. They have allowed double digit points to kickers 3 times and nine points another time. The odds are good that Myers is going to put up a nice haul for your team against Indy. This pick is a bit less sure than the others but there is solid potential. The Chargers have allowed a couple of BIG games to opposing kickers. McManus has been in double digits twice, but nothing too flashy yet. The consistency is not there for kicker or opponent, but there is a good chance for 10-15 kicker points here. The Dolphins offense was not completely inept in week 6, which is mildly concerning for this streamer. That is more likely proof that Atlanta is not even worthy of a stream on defense, however. The Dolphins are a very stoppable offense and the Jets have had a couple of decent showings. The personnel is there to make plays and the Jets are playing hard in spite of a likely lost season. They should bring Cutler back to his fantasy prison and shut down the Miami offense. The Titans defense can give up some seriously big plays through the air. On the other hand, Kevin Hogan looked like a Pop Warner quarterback playing an NFL defense on Sunday. The Browns have no weapons through the air aside from Duke Johnson Jr. and David Njoku. There is nothing for Hogan to get acclimated to here, the team has given him nothing to work with. There is a small chance that he turns it around against the weak Titans pass defense, but that is a risk I'm willing to take. The Eagles defense has been better in reality than for fantasy purposes. They have had one excellent game and that was against the Redskins in week 1. The 'Skins are coming to town in week 7 and they have not straightened out their offense yet. There is a strong possibility that Wentz puts up points quickly and makes Cousins throw. That is not a formula for success for Washington and that should mean turnovers. I like the Eagles as a streaming play for this week and feel free to hold onto them into week 8 for the 49ers. That rounds out the streaming picks for week 7 Kickers, Defenses and Quarterbacks. Good luck in your matchups and come back tomorrow for my week 7 waiver wire picks. As always, check us out on Twitter for more content: @_knuckleheads and @brendancole16.